When it comes to Residence Permit in Germany, there are different possibilities. 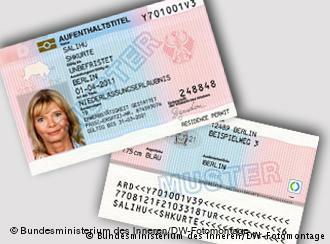 This webpage is dedicated to provide information about various Residence Permit possibilities when it comes to Residency in Germany. The following text provides a summary of various possible Residence permits in Germany (as per information available on 30.11.2017). · hold a permanent right of residence in another Member State of the European Union (section 38a of the Residence Act). A residence permit can be extended. It will always also be taken into account here whether the foreign national has attended an integration course in accordance with the rules. Foreigners from third countries (countries outside the EU, the EEA and Switzerland) may as a matter of principle only work in Germany if this is explicitly noted in their residence permit. Freedom of movement of workers applies to all EU citizens and nationals of EEA states, as well as Switzerland. You can obtain detailed information from the competent immigration authority near where you live. The EU Blue Card is a residence permit, initially generally awarded for a four-year period, available to nationals of third countries who have a university degree or equivalent qualification with the aim of enabling them to take up employment on the basis of their qualification. A further prerequisite is that the individual can supply evidence of an employment relationship through which a minimum annual salary of two-thirds of the annual contribution assessment ceiling for general pension insurance (2016: EUR 49,600) will be earned. With regard to professions for which there is particular demand in Germany, the salary limit has been lowered to 52% of the contribution assessment ceiling (2016: EUR 38,688). Holders of an EU Blue Card who can prove that they have been in qualified employment over a period of 33 months and that they have paid (compulsory) contributions to statutory pension insurance or comparable benefits are granted a permanent settlement permit. Provided that the individuals concerned can demonstrate having language skills at level B1, the settlement permit is granted after a period of 21 months. Proof of German language skills is not required in the case of accompanying spouses or spouses who subsequently move to Germany to live with their husband or wife. Spouses of holders of an EU Blue Card have immediate access to gainful employment. The settlement permit does not have a time limit. It allows you to work in Germany. To obtain a settlement permit, you must, as a rule, have had a residence permit for five years and also fulfil further conditions. Anyone wishing to apply for a settlement permit must for example make his/her own living and secure the financial independence of his family members, have adequate German-language skills and not have a criminal record. In certain circumstances, a settlement permit can be granted without the relevant conditions in relation to periods of time having been met, in the case of highly-qualified immigrants for example. The permanent EU residence permit is also an unlimited residence title that entitles the holder to engage in gainful employment. The qualifying conditions are very similar to those for the settlement permit. However, the permanent EU residence permit also entitles the holder to mobility within the European Union by granting a right to a limited residence title in the other Member States. NOTE: The proof of adequate German-language skills required for a settlement permit and a permanent EU residence permit can be obtained by attending an integration course and passing the exam.